"Animated Comic Adventure Has Some Good, but Falls Short"
MISSING LINK is an animated comic adventure, set in the late 1800s, about a wacky British explorer who searches for Bigfoot, whom he thinks is the missing evolutionary link between man and ape. MISSING LINK has some funny, exciting and suspenseful moments and teaches some strong morally uplifting values, but it also promotes humanist evolution in a politically correct way and contains some inappropriate gun violence. MOVIEGUIDE® advises caution for older children. 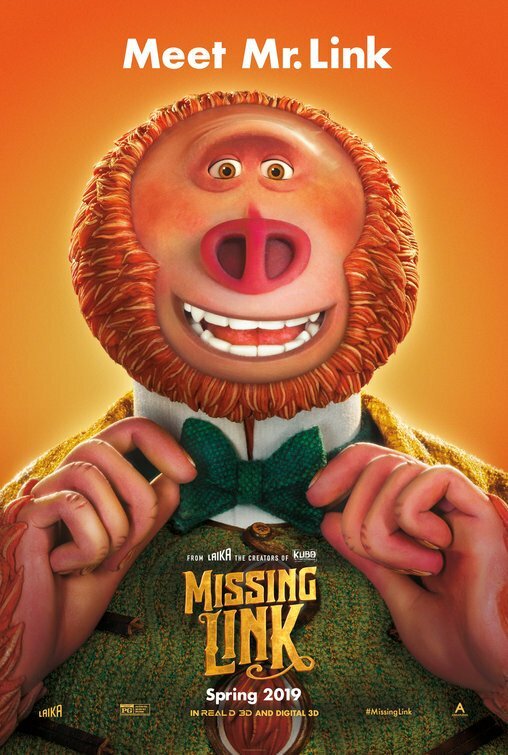 MISSING LINK is a quirky but fun animated comic adventure, set in the late 1800s, about a wacky British explorer who searches for Bigfoot, whom he thinks is the missing evolutionary link between man and ape. MISSING LINK has some funny, exciting and suspenseful moments and teaches some strong morally uplifting values, but it also promotes humanist evolution in a politically correct way and contains some inappropriate gun violence. MOVIEGUIDE® advises caution for older children. In the story, Sir Lionel Frost considers himself the foremost investigator of myths and monsters, but his fellow explorers who don’t agree and won’t let him into their club. The movie opens with Sir Lionel failing to obtain photographic evidence for the Loch Ness monster when his camera breaks. Because of his harrowing encounter with the monster, Lionel’s manservant and assistant quits. Sir Lionel won’t be deterred, however. After receiving a mysterious letter from the Northwest in America, he announces to his fellow explorers he’s decided to go there to find Bigfoot, aka Sasquatch. Lionel thinks Bigfoot is the “missing link” between ape and man, but his arch-rival is a staunch defender of human civilization and (rightly) believes that Lionel’s support for Darwinistic evolution is dangerous. So, he sends the world’s most dangerous tracker and hunter to kill Sir Lionel (not good). Lionel and Mr. Link begin the long journey to the fabled valley of Shangri-La in the Himalayan Mountains where the Yeti supposedly live. Along the way, they pick up Adelina Fortnight, a Spanish-speaking widow of another explorer who found a map to Shangri-La. Throughout the journey, they’re imperiled by the mean hunter sent by Lionel’s arch-rival. MISSING LINK has many funny, exciting moments and lots of colorful stop-motion and computer-generated animation. The final jeopardy in the movie is very suspenseful. One critic complained that the movie was a little talky. His complaint was true in a way, but the talky dialogue included a lot of funny lines and moments. So, it didn’t bother MOVIEGUIDE®’s reviewer as much. Finally, the movie’s third act features a major surprising plot twist. The plot twist undercuts some of the movie’s strong politically correct content, which promotes a false multicultural philosophy where the main villain is depicted as an anti-scientific opponent of evolution who’s afraid that the hero’s theory’s about a missing link will undermine human civilization. The plot twist shows that the villain isn’t the only bad guy who takes a fearful attitude toward others. Sadly, though, MISSING LINK still promotes the basic concept of humanist evolution, a theory which has been debunked by many knowledgeable scientific critics of various ideologies, philosophies and Christian denominational traditions. Another politically correct element is a feminist decision made by the lead female character, Adelina, who attracts the romantic attentions of Lionel. In contrast to all this, MISSING LINK does promote some morally uplifting values. For example, Sir Lionel is so concerned about his own reputation that he doesn’t consider the feelings and plight of other people. Thus, during his character’s journey in the movie, Lionel must learn to be less self-centered and selfish and look out for others. MISSING LINK also teaches viewers to be loving, kind and compassionate rather than hateful, selfish and misanthropic. Happily, MISSING LINK has no foul language or lewd content. There is, however, a moment where Mr. Link wants his first name to be Susan to honor a kindly female prospector he met once and admires. Finally, MISSING LINK has some violence involving a couple gunfights. There’s also a saloon fight and a lot of slapstick comedy where characters are accidentally hit or break things, sometimes with their bodies. The gunfights probably don’t belong in such an animated family movie, even though no one was seriously hurt. Taking into consideration all the bad and the good in MISSING LINK, MOVIEGUIDE® advises caution for older children. Some intense cartoon violence includes a couple gunfights, a fist fight in a Western saloon that enlarges to include all the saloon inhabitants, two characters struggle against the Loch Ness monster who hits them with fish and tries to drown them, a death-defying struggle against two villains above a long chasm, villain sends an evil tracker to hunt down and kill the hero, plus some comical slapstick violence such as a character tries to swing a man up over a ledge but the man doesn’t make it and slams against a wall, character accidentally breaks through a wall, character is accidentally hit in the groin, etc. Characters try to steal a map in safe, characters trespass and break a wall surrounding someone’s home, a male character wants to be called Susan after a kindly female prospector he met and admires. MISSING LINK is an animated comic adventure, set in the late 1800s, about a wacky British explorer. Sir Lionel Frost considers himself the foremost investigator of myths and monsters, but his fellow explorers don’t agree and won’t let him into their club. Sir Lionel gets a mysterious letter to come to the wilderness in the upper west coast of America to find Bigfoot. The letter turns out to be written by Bigfoot himself. The sweet but lonely creature convinces Lionel to help him locate his distant cousins, the Yeti, who supposedly live in the fabled valley of Shangri-La in the Himalayan Mountains. MISSING LINK has many funny, exciting moments and lots of colorful stop-motion and computer-generated animation. The final jeopardy in the movie is very suspenseful and leads to a nice finish. MISSING LINK teaches some morally uplifting values, including compassion and looking out for others. Also, the main hero learns how to be less self-centered. However, MISSING LINK also promotes humanist evolution in a politically correct way and contains some inappropriate gun violence. So, MOVIEGUIDE® advises caution for older children.